Newer Starshine is back! I'll be wiping the slate clean and re-creating in my original concept, of a retro 90's era Mario game, for example a Super Mario World sequel. The game will feature 4 main worlds, and a secret world! Nintendo: For creating NSMBDS. Thanks guys!! NSMBe: For creating the possibility to hack NSMBDS. Thanks guys!! PM me with your choice. Make sure to include some past work! You do not need to provide a download link to a demo of your hack. 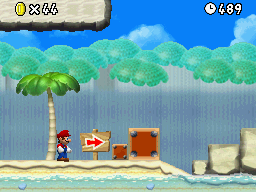 Your decision whether or not to release a demo will be respected, but it cannot be approved to NSMB Hacks until at least one world is available for download. A good description of the hack. One or more good quality videos. If someone cannot provide a video for hardware reasons, screenshots will have to do. Threads that do not comply with these rules will be deleted. It MUST have at least 1 COMPLETE WORLD AVAILABLE FOR DOWNLOAD. Good level design. Levels should be fun to play. Completely original levels. Levels that look like the original levels are not acceptable. Absolutely no glitched or broken graphics or tiles. A patch file available for download. I did put photos in but they didn't appear I fixed it!! The screenshots should now appear! My laptop battery died on me a couple of days ago. Hey! I got a new PC, so progress is one again, back on track!! Here's a video for celebration purposes! Here's a video for celebration purposes! So the port kind of sounds.... rough. It sounds better than the Super Mario All Stars 1 Port of the bonus theme you did in some other hack, but the soundfont makes it sound off. If you either used the Ghost House, Underwater, or the Pokémon HeartGold Soundfont I could tell you it would have sounded better. You do realise that this is the tower theme, so it's meant to have the soundfont of the tower. New theme! This one's for the W1 map theme! 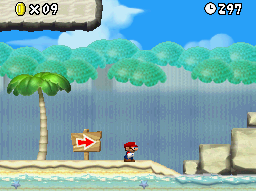 My favourite World Map theme from my favourite 2D Mario game. Neato! Thanks! It's my favourite too! I must be getting old if the NSMBWii Castle Theme is nostalgic. New Theme! This one's the 'Sand Bird' theme from Super Mario Sunshine! So while good port it would have been a lot better of you just used the beach soundfont. Unless your using this for a World Theme which is forgivable. I don't expect music to the most important thing of a hack ever. Demo v0.1 (World 1) should be released soon! This version is a simple update that fixes most minor things stated (flaws, of course) in newsuperhackboys' review of v0.1.